You are here: Home / Uncategorized / Where Can I Find the VIN on My RV – Camper, Travel Trailer, Motorhome, Fifth Wheel? There are times you need to locate the vehicle identification number (VIN) on your camper, travel trailer, fifth wheel or motorhome. Finding it can be quite a challenge on some RVs. Travel Trailers or Campers – along the frame and along the tongue and inside exterior compartments and interior cabinets. Fifth Wheels – at the front lower exterior wall/sidewall on the roadside or along the framework of the pin box. Motorhomes – from the outside, look through the driver’s side windshield or search around the driver’s area of the cockpit. If a quick search in these places doesn’t turn up your VIN, keep up the search using the lists below. Keep in mind the VIN may be on a vinyl or paper sticker, on a metal plate welded somewhere onto your RV or it could be stamped right into your metal frame. Frame rail as it leaves the trailer tongue. Motorhomes have two VIN’s. One VIN is for the completed motorhome and one is for the chassis (the framework the motorhome is built on). Motorhome manufacturers such as Thor, Tiffin, Fleetwood and Newmar build their motorhomes on top of a chassis and engine combination. Motorhome manufacturers buy their chassis from outside companies such as Freightliner, Spartan or Mercedez-Benz. Each of the chassis comes with its own vehicle identification number (VIN). Don’t confuse this VIN with the VIN for the completed motorhome. It is a good idea though to make a note of the chassis VIN if you find it. You may need it in the future. When you purchase your RV, you’ll register it with the State using the VIN for the completed motorhome. And this VIN is the one you need in most cases, unless you have a chassis problem. So don’t be confused if you locate two separate VIN’s. As an aside and to make things more interesting, I understand the Fleetwood motorhomes have what Fleetwood calls a FIN (Fleetwood identification number). But you can easily tell it is not the VIN since it doesn’t have 17 digits as all VIN’s have. What if Your VIN is Rusted or Painted Over or Corroded? Older or vintage travel trailers and campers may have layers of paint, rust or corrosion covering the VIN. Use emery cloth or steel wool to scrub away the layers of rust, paint or corrosion. If that doesn’t work, use a steel brush or a steel brush attachment on a drill to carefully expose the VIN. VIN’s are often located in more than one place so if you find a VIN that isn’t legible, look for another one. Contact an experienced RV repair person. They could possibly tell you where to locate the VIN on your model of RV. They have to find them to order parts or do warranty work. Your local Department of Motor Vehicles and police officers can find RV VIN’s. Obviously, the motor vehicle department and police department are last-ditch efforts, but maybe that is what you need. 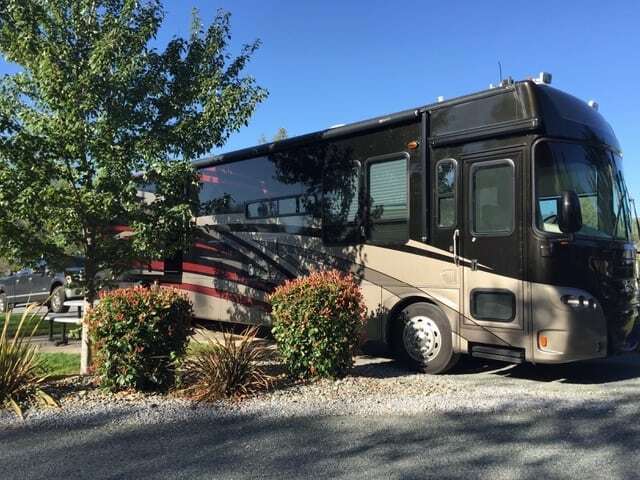 Of course, if you are locating the VIN just because you need the number and you aren’t comparing the VIN on the RV to the VIN in your paperwork, you can always read over any documents you have about your RV, including old repair invoices. Repairmen will often note the VIN on their bill. And any sales documents prepared when you bought the RV could include the VIN, as well. By the way, the letters i and o will not be in the VIN. To avoid confusing i and o with the numbers 1 and 0, they aren’t used in vehicle identication numbers. How Can You Tell What Year Your RV Is Using The VIN? The RV year is an important date to know. Before you even buy your RV you’ll want to make certain the seller isn’t misrepresenting the RV you’re looking at – whether it’s by mistake or on purpose. As you know, the purchase price can fluctuate greatly according to the year of the RV. The purchase price of a current model year will be much higher than the purchase price of an identical RV even one year older. So, double-check the year of the RV to make certain you are not paying more than you need to. Also, when ordering a part for the multiple small repairs RV’s need, the model year can make the difference between getting the correct part the first time around or not. Find the 10th digit from the left (which is also the 8th digit from the right since all VIN’s are 17 digits long). It will tell you the model year of the RV. You’ll find this digit is either a number or a letter from the alphabet. Either way, you’ll be able to determine the model year using this digit. Model years from 2001 through 2009 are designated using a number – 1’s are for 2001, 2’s are for 2002, etc. Model years before 2001 and model years after 2009 use a letter instead of a number. If your VIN has a letter, look at the chart below to determine the year.